The Transporter will not be published on Friday, Dec. 26 but will resume in January. It has been nearly two years since I was appointed chairman of the Idaho Transportation Board and more than 20 years since I served as the ITD’s first director. Much has changed in the past two decades, but I am grateful to see one thing has not – the professionalism and dedication of ITD’s staff... Even during these difficult economic conditions, you remain focused on serving the people of Idaho. As we approach the end of 2008, we have an opportunity to reflect on our many accomplishments of the past year and prepare for new challenges that 2009 will bring. I remain optimistic that we are slowly recovering from an economic downturn that stifled the national transportation industry and wreaked havoc on state government budgets across the country. We have already seen a tremendous drop in the price of gasoline, record drops in interest rates and a more stable stock market. Those are good signs. Before the first major snow of the season touched the ground, District 3 communication specialists Reed Hollinshead and June Sparks hit the road, touting the benefits of the 511 Traveler Services system for Idaho motorists. Their mission in the Treasure Valley was to implore local media to include the 511 logo and links to ITD’s 511 Web site. Winter maintenance operations in northern Idaho are facing some unique challenges as temperatures drop to near record lows, ITD announces. Crews are switching to sanding material as salt becomes less effective in extremely cold temperatures .Motorists are urged to drive with caution at all times, especially during severe weather conditions. Be aware of potentially icy areas such as shady spots and bridges. Stuart Davis, Executive Director of the Idaho Association of Highway Districts, told members of the Idaho Transportation Board last week the public does not know or care if they are traveling on a state or local route. It is important for the state and local transportation systems to work together to provide a seamless system, he said during the December board meeting in Boise. Both the state and local systems share a responsibility of operating a transportation network that is safe and efficient. What happens in Vegas stays in Vegas - unless you win big at the slots, hit the trifecta, roll snake eyes…or compete in the National Finals Rodeo (NFR) on the 50th anniversary of that great event. Such is the case for Jim Wolf, an inspector on the District 3 Region 1 construction team and ITD employee since the spring of 2001. He recently returned from Las Vegas with a gold buckle from the 50th NFR. Wolf and partner Cody Jail participated in team roping. The best form of Internet security and preventing computer attacks by information thieves sits in the chair in front of your computer. That simple, yet profound, advice came during a two-hour presentation on cyber security by Terry Probst-Martin, Chief Technology Officer for the Idaho Department of Administration this week at ITD Headquarters. ITD implemented more than 120 efficiency measures, saving millions of dollars in 2008, according to a report issued by the agency this week. The 2008 Idaho Transportation Department Efficiency Report outlines cost-cutting measures completed in 2008 and identifies future efforts. It seems like a simple question. Do you wish to be an organ, eye and tissue donor? But the answer to that question, in a time of crisis, can be a source of comfort to the donor’s family and a life-saving decision for prospective transplant recipients. More than 100,000 people, roughly twice the population of Idaho Falls, are on a national waiting list for transplants. “Don’t drink and drive,” “Wear a seat belt” and “Don’t speed” are some of the important highway safety messages that elementary school students across Idaho trained their colored crayons, pencils and markers on for ITD’s Office of Highway Operations and Safety. ITD’s 2009 Highway Safety Kids Calendar features the talents of the top 14 young artists whose work was chosen from entries submitted by K-6 teachers from throughout the state. ITD employees who want the best value for their dollar when filling holiday shopping lists might consider starting with their Perks Card. The cards open the door to discount products and services ranging from automotive to travel. The Sand Creek Byway, a new 2.1-mile segment of U.S. 95 that will remove through traffic from downtown Sandpoint, will be the first field test for the On-Site computer program. On-Site is a component of a software suite from Bentley Corp. that ITD introduced in 2007 as part of a major CADD (computer assisted design and drafting) upgrade. 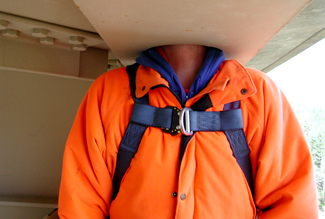 Jim Holland sometimes sticks his neck out while looking for trouble spots on Idaho’s bridges. Occasionally he even gets lost in his work, as he did recently while inspecting the Moyie River Gorge Bridge in District 1. He wasn’t actually left hanging from the bridge but was suspended, along with partner Rick Smith, in the bucket of ITD’s ReachAll truck. Smith took the photo while Holland looked inside the lower chord of the truss.